Redwood trees can grow to over three-hundred-fifty feet in height and thirty feet in diameter, but because they cluster in dense, secluded groves they can be hard to find and almost as hard to measure. Basically you have to climb to the top and drop a string down to the ground. Only a handful of people are well acquainted with these remarkable beings, and they guard closely the secrets of the trees, including exactly where the biggest ones are. This book is about these few people and their adventures in the last two decades. Some are hardworking hobbyists with day jobs, others have followed their visceral fascination with the redwoods to biology careers spent exploring the breathtaking and often dangerous treetops. Like the undersea world, there's more up there than most people thought—an ecosystem of ants and plants and salamanders. These trees live their lives on a scale hard for humans to comprehend: their size makes them seem to be unchanging, but to add even a quarter inch a year requires rapid growth. The very tallest may be older than the Parthenon. 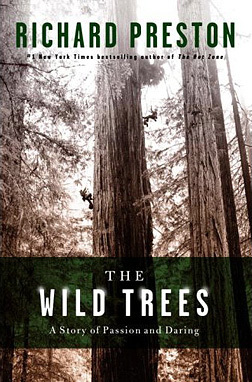 This book is more about the people who love the trees than the trees themselves, which suited me fine, since I think science goes down best with a heaping helping of story—a love story, ideally, and there's one in here. Preston is a skilled writer who makes the most of a collection of appealingly odd characters and a breathtaking setting. I wish he'd been able to resist writing himself into the narrative, but that's a small quibble with an otherwise terrific book. The author of Blue Clay People, a personal story of development work in Liberia, was re-posted to Bolivia and wrote this equally engaging and thought-provoking book about the indigenous people of the rainforest, multinational energy companies forced to change their ravaging ways, and their sometimes competing interests in the lungs of our planet. Again Powers mixes politics, history, personal stories of people he meets, and his own reactions and conflicts. He is not in Bolivia to impose his own idea of progress on the locals—he's well aware that wealthy Westerners aren't necessarily healthier or happier than those who live hand to mouth. But he doesn't idealize the poor or indigenous people either—he's frustrated at their nepotism, corruption, and prejudices as much as he is at those of the people who try to take advantage of them. He's particularly good at deflating assumptions, like the idea that green development is a luxury that the poor cannot afford, and untangling the complex layers of social interaction, such as when some indigenous men offer him coca leaves and he knows that if he declines he'll be one kind of insulting cliché but if he accepts he'll be another, equally insulting one. At the end of the book, after six years of hard work abroad, Powers is missing the United States and feeling ready to start a family. I hope that doesn't mean settling down—it seems to me he has a couple of continents left to visit, and a few more books to write. 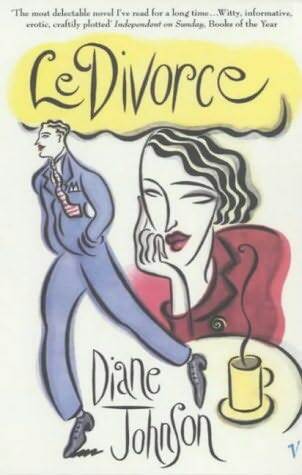 I passed over this book many times because it looked to me like an Olivia Goldsmith-type farce making light of divorce, and that didn't seem fun at all. Of course, it's a huge bestseller so it must have been finding plenty of readers who, unless they were misled, are either less judgmental or more astute than I. Come to think of it, I've never actually read Olivia Goldsmith, so maybe I'm misjudging her, too. Francine Prose got me to read this book; she included it in Reading Like a Writer on her august list of books to be read immediately, alongside Middlemarch and Paradise Lost—I figured I'd pick the low-hanging fruit first. It's the story of Californian Isabel Walker, out of school and not sure what to do next, on an open-ended trip to Paris to visit her pregnant sister who has just been left by her French husband. I think I liked best that narrator Isabel never tries to get the reader to like her—and I never really did. Yet her adventures and observations are intriguing, and the book is a pleasure read, even when things turn dark. Florence Greenglass and Solomon Dubner were both born Jewish in the early twentieth century, and both were both drawn to Catholicism as teens. When they meet and marry they reinvent themselves as devout Catholics Veronica and Paul Dubner and raise their eight children on a diet of Christianity, hard work, and health food in upstate New York. Their youngest, Stephen, upon leaving his insular family life for college, gets to know Jews for the first time and immediately feels a sense of familiarity and kinship. Already often mistaken for a Jew, the former altar boy is soon living a Jewish life in New York City. 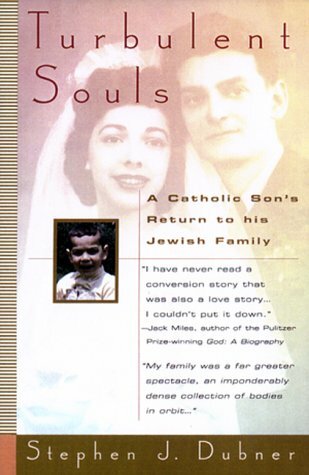 He comes to peace with his memories of his father, who died when Stephen was ten, and with his mother, who never wavers in her adoration of Jesus; he reunites the Catholic and Jewish branches of his extended family; and he writes this captivating book. Note: Like Dubner himself did, his book is undergoing an identity makeover in mid-life. Nine years after its initial publication, it's being re-released as Choosing My Religion: A Memoir of a Family Beyond Belief—a catchy if somewhat misleading title, with a snappy new cover to match. Perhaps it's just an attempt to ride the wave of Freakonomics' popularity (Dubner was the writing half of its authorial team), but this book deserves new attention. I judged this book by its cover. A 1970s palette of burnt orange and avocado, a William Eggleston photo of two young women in an intensely pensive moment on a couch—there's no way I wasn't taking this one home. I remembered the author's name from Naked Sleeper ten years ago, and this new novel turned out to be similarly intelligent and quietly engrossing. The narrator is the college roommate of a privileged woman who, bearing more than a passing resemblance to Kathy Boudin, allies herself with the radical movements of the 1960s and gets drawn into life-altering violence. 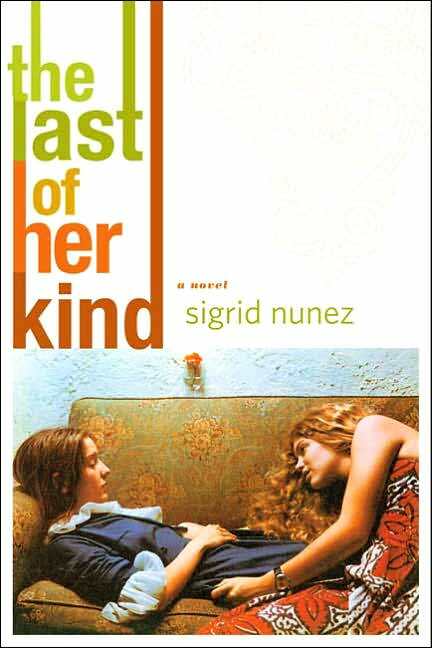 The lives of the two women meet and diverge several times over the following decades, and their stories are satisfying for their unpredictability. I hope this fad of breathless, paragraph-length subtitles is over soon and we can put the "subtle" back in "subtitle." 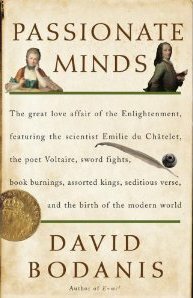 Once I finished reading the cover and got to the book I enjoyed it for its humanization of the well-known Voltaire and his undeservedly obscure lover, Emilie du Chatelet. Du Chatelet, an astronomer and mathematician who apparently laid the groundwork for Einstein's E=MC2, chafed at her upper-class early-eighteenth-century French life and was rescued when she met Voltaire, a man who could appreciate and challenge her. Society in that time and place being the way it was, her marriage to someone else was no impediment to her living with Voltaire and they began a passionate partnership, thinking and writing together. Bodanis does an excellent job of bringing history to life and showing us that human nature hasn't changed much over the centuries; the lover's spats of these remarkable people could have been pulled from this morning's advice columns. Voltaire's ego, hypochondria, and troublemaking doomed their liaison, and then du Chatelet's accidental pregnancy (not by Voltaire) at the age of forty-two killed her—but they had front-row seats at one of the most exciting times ever to be alive, and they made history. 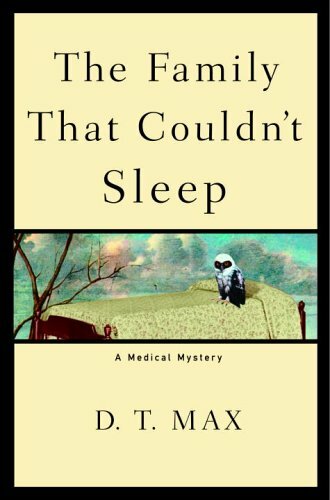 Prions, the mysterious substances behind mad cow disease, are responsible for several strange disorders, perhaps the strangest and most horrifying being fatal familial insomnia. Most of the sufferers of this hereditary disease are members of one Italian family. The disease usually strikes the victim in middle age, when he or she loses the ability to sleep and eventually goes mad and dies, aware all the while of what is happening. Max ties together the family's story with that of prions, including where they might have come from and how they were discovered. Human mistakes led to their gaining a foothold, but humans may be able to defeat them. We can only hope. Michaels' point that we as a society get exercised about racial and cultural diversity while ignoring economic injustice is certainly well taken. But I think he misses some other points, such as when he insists that deafness is a medical, not cultural issue, or doesn't see that prejudices of groups against outsiders are not only based on culture but sometimes on race as well. I think he's also missing the importance of linguistic diversity for its own sake, not acknowledging that something of value is lost when a language disappears. In general, he favors rational and economic explanations and downplays the importance of culture. 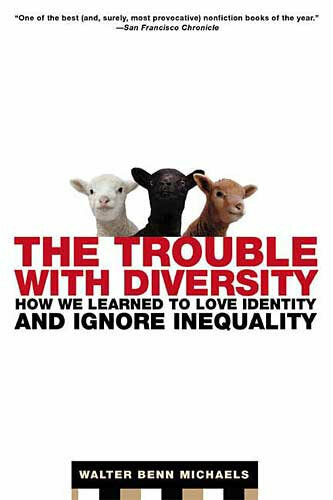 But a rational voice on these subjects is refreshing and sorely needed, reminding us that including poor people as representatives of "diversity" is doing them no favors. What they really need is to no longer be poor.